Left behind in boxing, intercollegiate heavyweight champ Willie Ferrell has found an outlet for his grief, while Georgia always has Jonathan near her heart. This story appeared in the April 14, 2014, issue of Sports Illustrated. Subscribe to the magazine here. 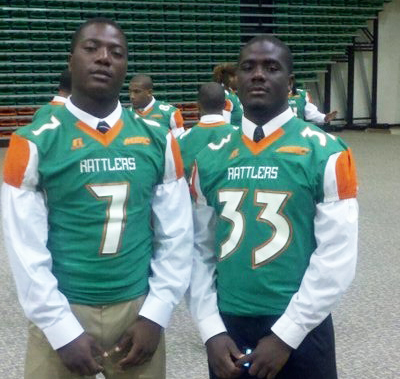 Florida A&M football standouts Jonathan and Willie Ferrell were as close as brothers could be. Tucked away in a neutral corner of Tallahassee, the Renegade Boxing Club is in a converted warehouse, accessible only by a dirt path and spartan even by boxing-gym standards. One of the founders was a Florida State grad student looking for life beyond his laptop. Most afternoons you'll find Willie Ferrell at Renegade sparring, slugging the heavy bag, skipping rope. On a Tuesday in February, Willie's mom, Georgia, popped in and took a seat on a folding chair next to the ring as her son wrapped his hands. Soul music shot from a stereo, mixing with the soundtrack of Ferrell's workout. "Left a good job in the city...."
Ferrell, 24, stands 6'3" and, on this day, weighs in at 225 pounds. His body fat is negligible. His veins look as if they're trying to break out of his skin. He's the best fighter in the gym, so he handicaps himself accordingly. Sometimes when he spars, he'll throw only jabs. Other times he'll fight with an arm pinned behind his back. Just to keep things interesting, he'll change the size of his gloves. The workouts have an emotional range, too, though Ferrell can't control this. Some afternoons his head will be free of what he calls "the clutter," and he'll go through his routines just fine, smiling behind his mouth guard. Other days he'll enter the ring flooded with thoughts of the last few months. On those days his sweat will mingle with tears. Recently he found himself crying during a sparring session, and when it was over, he ran out of the ring, locked himself in the bathroom and sobbed. 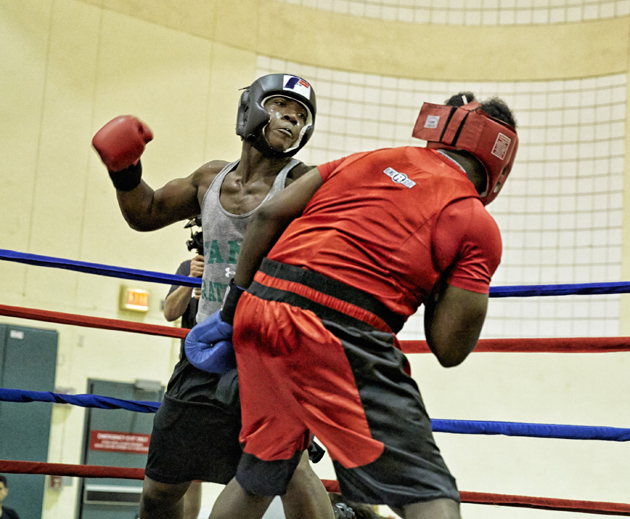 This spring Ferrell's time at Renegade also doubled as preparation for the U.S. Intercollegiate Boxing Association's national championship, in Miami in early April. Representing Florida A&M—where he's finishing up a degree in social work—Ferrell would try to defend his title as heavyweight champion. The tournament would also mark his first official competition since the day of the tragedy, the day he lost his second self. Those who knew Jonathan Ferrell can't remember him ever cursing. Not even a damn or a hell. Just wasn't part of his makeup. But in the wee hours of Saturday, Sept. 14, 2013, Ferrell would have been justified in letting loose an expletive or two. What had already been a long day had gotten considerably more complicated. Ferrell, then 24, had been living in Charlotte for a year. That Friday he worked shifts at both of his jobs as a salesman, at Dillard's department store and in the appliance department of Best Buy. He changed out of the Best Buy khakis he wore so grudgingly, threw on a pair of jeans and met some friends and coworkers at the Hickory Tavern. Assuming a role he'd played since high school in Tallahassee, he was the designated driver. It was well into the infomercial hours when he dropped off a colleague and headed home. After totaling his car, Jonathan (33, with Willie) happened on McCartney's house, where he was hit 10 times in a fatal fusillade by Kerrick. Ferrell was driving a black 1999 sedan owned by the father of his fiancée, Caché Heidel. On a curvy ribbon of Reedy Creek Road, Ferrell swerved off the pavement. Maybe it was the dark, or the fog, or his lack of familiarity with the area. Maybe it was exhaustion. This we know from toxicology tests: Ferrell was neither drunk nor under the influence of drugs. The car veered over the gravel shoulder and fell into a ravine amid a cluster of trees. It was after 2 a.m. in a deserted area, and the car was totaled. No door would open. Ferrell groped for his cellphone but couldn't find it. He was wearing only a tight T-shirt that strained against his 200-pound frame. It was getting cold. Ferrell reportedly kicked the back windshield until it cracked. A college football player just a few autumns before, he lowered his shoulder, rammed his way through the windshield and staggered up a hill. He was barefoot, having lost his shoes while breaking out of the car. After a few hundred yards he reached the Bradfield Farms subdivision, a standard-issue sweep of suburbia 15 miles northeast of downtown Charlotte. He knocked on the first door he saw. A 32-year-old woman, Sarah McCartney, opened the unlocked front door, thinking it was her husband, a nurse, returning from a late shift. When she saw Ferrell, who had sustained a cut on his head getting out of the car, she slammed the door, activated her home-security system and dialed 911. In a call that would last 17 minutes, she was clearly panicked. She told the dispatcher that she was home alone with her infant son. "There's a guy breaking in my front door!" she said. "He's trying to kick it down." A male voice, presumably Ferrell's, is on the recording calling out, "Hello." Twenty-seven seconds into the call, McCartney, who is white, mentioned Ferrell's race. DISPATCHER: "Have you seen this person?" MCCARTNEY: "Yes, he's a black man." DISPATCHER: "You say he's a black male?" MCCARTNEY: "Yes. Oh, my God." DISPATCHER: "Is he still there?" Ferrell didn't try to enter the house, much less kick in the front door. But when the dispatcher asked if the man had entered her home, McCartney said, in a voiced edged with terror, "He's not in the house, he's in the front yard yelling! Oh, my God, please! I can't believe I opened the door. I don't know what the f--- is wrong with me." Eleven minutes from the start of the call, three patrol officers pulled up to the house, two of them African-American, one Caucasian. Ferrell was still outside, near the driveway. At least one of the officers activated a "dash cam" in his cruiser and began to approach the alleged intruder. Ferrell had no criminal record, but he had more than a passing familiarity with law enforcement. His sister, Georgella (Joy) Dent, was a sergeant with the Leon County sheriff's office in Tallahassee. So was her husband, Jerry Dent. McCartney had told Ferrell through the door that she was calling the police, and Ferrell's family believes that was, for him, an incentive to stay, not to flee—the police would help him. When the officers arrived, he approached them to explain what had been a series of unfortunate events. "He was always a Good Samaritan," says Georgia Ferrell. "On that night he was looking for someone to be a Good Samaritan to him." The officers saw it differently. According to a release from the Charlotte-Mecklenburg police, "[U]pon the officers exiting their vehicles, Mr. Ferrell immediately ran toward the officers." One of the black officers deployed his Taser, but it didn't activate. The white policeman, Randall (Wes) Kerrick, 27, had joined the force as an animal-control officer in 2010. Kerrick is modest in stature, with a tight crew cut. He had been promoted to patrol officer in late 2011. While he had been given a minor disciplinary suspension in 2012, he had also received a commendation for his role in a robbery case. Now, at around 2:40 a.m. in a suburban neighborhood, Kerrick, unlike his two partners, drew his semiautomatic. His finger curled around the trigger. Pop. Pop. Pop. Pop. Pop. Pop. Twelve shots, fired by Kerrick from close range. Ten struck Ferrell. He was pronounced dead at the scene. From the Mecklenburg County Medical Examiner's autopsy of Ferrell: Postmortem examination reveals a well-developed, muscular young adult black male with a total of ten gunshot wound injuries of the body. The autopsy notes one last indignity. As Jonathan Ferrell lay dying on the pavement, he was placed in handcuffs. He arrived at the morgue with his wrists tied behind his back. The next morning, in Tallahassee, the Ferrell clan formed an army. Knowing how hard Jonathan's death would hit Willie, they needed to fortify their ranks before telling him. Georgia led the way, trailed by her daughter and two eldest sons, then a phalanx of cousins and uncles and aunts. They converged on Willie's apartment. "It was like I was the father or something," Willie recalls, "and they were coming to tell me [my son] had passed." Offensive line football coach Edwin Pata advised Willie after his brother's death. They are twins. One just came out late. That's how Georgia Ferrell always described Jonathan and Willie, the youngest of her five children. Jonathan was born in October 1988, and Willie arrived 16 months later. On the family's plot of farmland outside Tallahassee, the two boys raced and wrestled and wrangled animals. On Christmas Eve 1993, their father, Willie James Ferrell, died of a brain tumor. After that, friends and relatives suggest, Jonathan and Willie became each other's surrogate dad. They had a slightly different assessment. According to Willie, "It's more like we were each other's big brother." Describing Jonathan and Willie as close doesn't capture the dimensions of their relationship. When Jonathan was diagnosed with an allergy to seafood, Willie, in solidarity, stopped eating seafood too. When Willie, a lefty, tore ligaments in his dominant hand, Jonathan taught him how to write righthanded, which Willie does to this day. During one high school football game, Willie broke his leg; Jonathan charged onto the field and, fueled by love and adrenaline, carried him to the sideline. Three weeks later Jonathan's grass allergy acted up during a game; Willie, broken leg and all, hobbled from the field to the team bus to get his brother's inhaler. For as long as they could remember, the brothers felt a sting when they had to say goodbye to each other. So they didn't. In person and on the phone, they parted by simply saying, All right then. Yeah. "Saying goodbye," says Willie, "was too, like, final." From early on, Willie was every bit as big as his big brother. Jonathan was confused for Willie and Willie for Jonathan, and everyone assumed they were twins. Temperamentally, though, they could scarcely have been more different. Jonathan spoke only when he felt he had something worth saying. He was an admitted mama's boy who, even as a teenager, would climb into Georgia's bed. He hated balloons; the pop scared him. He loved the Detroit Lions because there was something ennobling about rooting for a team so hopeless. Jonathan took in stray animals—not just dogs and cats but also spiders and snakes. Once, when Willie was about to kill a cockroach, Jonathan said, "If you're not going to eat it, you can't kill it." Willie squashed the bug anyway. It led to one of their rare fights. Willie Ferrell, of course, shares his name with a famous comedian, and he seemed to take it to heart. "That boy lives to make people laugh," says Mike Ethridge, a cousin. Willie holds a grudge against silence. He doesn't have a Twitter account; he has three. When he first laid eyes on his girlfriend, Deidre Grant, in a crowded school cafeteria during his freshman year of college, he didn't just talk to her; he introduced himself by performing an impromptu song-and-dance routine. The brothers' closeness and their differences also deepened on the football field. 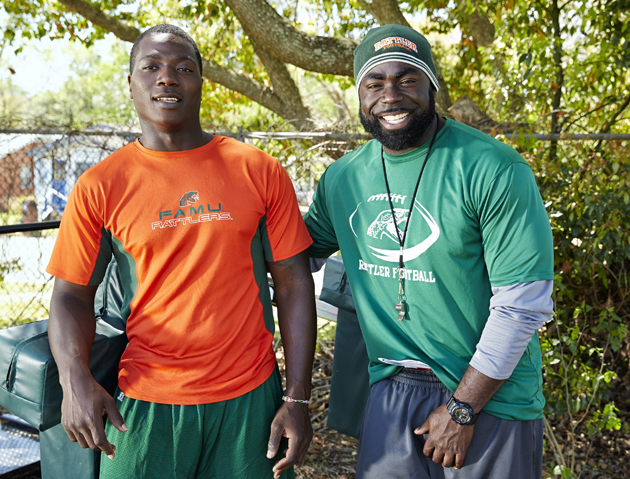 Jonathan was twice an all-state safety at Florida A&M University High. He hit like a linebacker and held his own covering future NFL receivers such as Kevin Elliott and Brian Tyms. "He was a disciplined, quiet kid, a silent leader who made noise with his shoulder pads," says Ira Reynolds, the Ferrells' coach. "I'm thinking now of some hits he made, and it's giving me chill-bones." Jonathan made a verbal commitment to LSU early in high school, but as a senior in 2008 he switched his choice to Florida A&M, a historically black college on Tallahassee's hilly south side. FAMU was a solid program, dense with NFL alumni, but everyone knew the real reason Jonathan chose to go there: He wanted to stay near his brother. While Jonathan was a damned good player, Willie was even better. In seventh grade Willie started at linebacker for the high school team. He loved the collisions and used a mix of speed, strength and skill to seal holes and pile-drive opponents. Georgia recruited him as an eighth-grader. By his sophomore year he was 6'2" and 225 pounds, a five-star recruit with scholarship offers from most SEC programs. FAMU High won the 2006 state championship as Willie made 22 tackles and Jonathan had two interceptions in the title game. Coach after coach navigated the country roads to the Ferrells' home. "I don't want to get no one in trouble," Willie says before telling of one unnamed recruiter who came by unannounced at 2 a.m. That recruiter is now an NFL head coach. Another recruiter tried to sneak onto the team bus to talk to Willie. "Everyone wanted a piece of him," says Reynolds. "His motor didn't stop." Jonathan told Willie he should play in the big time, the SEC, so Willie signed with Ole Miss. He showed up in Oxford during the summer of 2009. While the coaches decided whether Willie should play, redshirt or spend a year at a prep school, he became homesick. He left the team before the season started, and midway through the semester he transferred to Florida A&M. "It was predictable," he now admits. Reunited in Tallahassee, the Ferrell boys lived together and ate most meals together. Three days a week they visited their high school as part of a mentoring program. Jonathan told the FAMU student newspaper, "Playing football with him again feels like it did in high school, summer nights you don't want to end because they are so much fun. It's refreshing to come in the locker room and have your best friend to laugh with." Before the Rattlers' 2010 homecoming game the brothers leaned against a storage shed near the field and cried tears of joy. "I mean, who's lucky enough to play with their brother?" Willie recalls. "It was overwhelming." 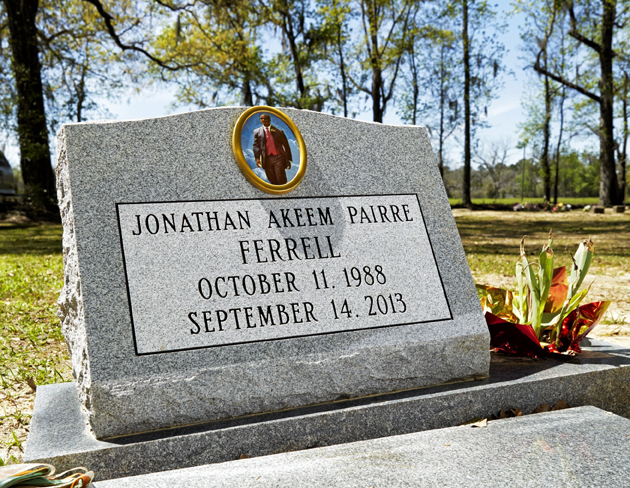 The headstone of Jonathan Ferrell at Saint Stephen Missionary Baptist Church Cemetery. At FAMU they had overlapping circles of friends, and both gravitated to Edwin Pata, the youngest coach on the staff. With his dark complexion and tree-trunk chest, Pata resembled Willie and Jonathan—so much so that other players called him Papa Ferrell. Pata, a former Florida State tight end, had played high school football in Miami alongside his younger brother; the Ferrells, he said, "so much reminded me of how I grew up." Jonathan's NFL dreams didn't crash; they wafted away. By his senior year his passion for football had been transferred elsewhere. He was getting deeper into his automotive-engineering studies. He had also fallen in love with Caché—Willie introduced them—and wanted to spend more time with her. He talked to FAMU coaches about his diminishing interest. They tried to dissuade him. "Keep playing," they said, "and you'll keep your scholarship." "That wouldn't be right," Jonathan responded. He handed back his scholarship, applied for financial aid and took a job at Wal-Mart to help pay his tuition. Though Willie was among the best players in the conference, he, too, cooled on football. It wasn't just that his brother was no longer on the team. On a whim he had tried boxing. Willie had never been in a fistfight, but he had strength and speed and discipline to burn, and all the footwork drills from football made him a fast learner in the ring. Plus, a new boxing coach had arrived in town from Pensacola—Kimmus Jones, cousin of Roy Jones Jr.—and he quickly pegged Willie for a future pro. Day after day they worked out. To Willie, putting together combinations felt as natural as breathing. Before more than one amateur fight, the opponent got one look at Willie's muscles at the weigh-in and hightailed it home. Willie joined the FAMU boxing team and encouraged Jonathan to join. "Nah," Jonathan said, "I'll watch you." Last spring Willie competed as a heavyweight in the Intercollegiate Boxing Association championships in San Francisco. Jonathan had work and classes, so he couldn't make the trip. He and Willie FaceTimed before and after fights. Willie won three bouts in three days to take the title. When he FaceTimed his brother and showed off his new belt, Jonathan cried. Not long before that, Jonathan made the decision to relocate. Caché had landed an accounting job with Ernst & Young in Charlotte, and Jonathan was going with her. The plan was for him to finish up his engineering degree at Johnson C. Smith University while they socked away money. Soon enough they would get married and start a family. Jonathan, the kid who hated saying goodbye, didn't tell his family about the move until he was already in Charlotte. "He told me that if we'd had a proper goodbye," Georgia recalls, "he never would have left." As Jonathan built a new life in a new state, he and Willie stayed close. They texted and swapped funny photos. Still, contours shifted. Willie noticed that the pronounsI and you started to crop up at the expense of we. In the summer of 2013, Jonathan visited Tallahassee and told Jones, "I need you to keep looking out for Willie." He said something similar to Pata. "I'm telling you," says Willie, his voice catching, "it was like Jon knew something was about to happen." IN 2011, during the football season after the Ferrell brothers last played, FAMU did a few rotations in the national news cycle. Following the Rattlers' game against rival Bethune-Cookman, FAMU's famed band, the Marching 100, climbed aboard its buses. In a brutal hazing ritual known as Crossing Bus C, a few unfortunate souls felt pressure to shroud their heads in blankets and run down the aisle while being pummeled by other members. Robert Champion, a clarinet-playing drum major, was kicked and punched so severely that he died of blunt-force trauma and internal bleeding. A lawsuit—still wending its way through the court system—was filed on behalf of Champion's family by Atlanta-based lawyer Chris Chestnut. After Jonathan's death, Georgia recalled Chestnut's name and his advocacy in the Champion matter. As it turned out, Chestnut's own mother had grown up in Tallahassee and gone to FAMU High, so he had followed the news of the shooting. Georgia called Chestnut and asked him whether her family had a case. "Do you have a case?" said the outspoken Chestnut, who talks in evangelical cadences. "This was cold-blooded murder!" A wrongful-death suit filed by Georgia in January names as defendants the city of Charlotte, Mecklenburg County, Charlotte-Mecklenburg police chief Rodney Monroe and the shooter, Kerrick. According to the complaint, "The Police Department used excessive force ... and executed their duties in a grossly negligent manner which proximately caused personal injuries to, and the wrongful death of, Jonathan A.P. Ferrell." The key to the case, Chestnut says, is the dash-cam video, which he has viewed along with Georgia, Willie and Caché. Chestnut claims that the video clearly shows the unarmed Jonathan approaching the police officers with his hands out. According to Chestnut, the officers never identified themselves as Charlotte police, never said "Stop, freeze" or "Excuse me, sir." And when they finally did issue commands, according to Chestnut, the gunshots were so immediate that Jonathan had no time to react. "You hear Officer Kerrick shoot him," says Chestnut, "and he emptied [the clip]." Ferrell had committed no crime. Not only was he unarmed, but, barefoot and wearing only a tight T-shirt and jeans, he clearly wasn't hiding a weapon. Even given his imposing physique, he was outnumbered by the police three to one. That some shots were fired downward—with Ferrell most likely on the ground—would undermine claims that the officers thought they were in danger. "There is an issue," Chestnut says, "of paramilitary policing in Charlotte." Asked if he favored the release of the dash-cam footage, Chestnut was emphatic: "If they would release it, I'd give you my FedEx number so you could watch it tomorrow." SI's request to see the dash-cam footage was also declined; the police department, citing a North Carolina law, said that "records of criminal investigations conducted by public law enforcement agencies ... are not public records." Why then did the department release the audio of the 911 call? Police officials and the state attorney general's office would not comment. "I don't understand it—I would have left both out," says Steve Ward, a Charlotte assistant DA from 1985 to 2011. "This is evidence, and we don't need a public viewing until it comes up at trial." The civil suit does not stress the thorny theme of race. But to many, the circumstances of Ferrell's death followed a distressingly familiar pattern, touching the rawest of nerves: another young, unarmed black man killed, his life seemingly deemed disposable. Ferrell's killing echoed the death of Oscar Grant III, the unarmed Oakland man who was shot in the back by a white Bay Area Rapid Transit police officer, as limned in the movie Fruitvale Station. It recalled the shooting of 60-year-old Roy Middleton by police officers in Pensacola, Fla., after he was suspected of breaking into a car and then failed to comply with orders. (Middleton was indeed entering a car: his mother's. Because the car was hers and was parked in his own driveway, he assumed the commands yelled at him came from neighbors playing a joke.) And while the facts and circumstances aren't identical, parallels were inevitably drawn between the deaths of Ferrell and Trayvon Martin, the unarmed teenager killed in Sanford, Fla., by George Zimmerman, a neighborhood watch volunteer, who was acquitted of second-degree murder after claiming self-defense. Mindful of the pending civil lawsuit, the Ferrells choose their words carefully. "We're gonna wait on that" is Willie's stock answer when asked what role race played in his brother's death. The furthest the Ferrells will go is to allege that "subconscious bias" most likely was in play that night. Pata is less guarded. "You had two black officers who didn't draw their weapons and one white officer who [shot]," he says. "That should be an indication right there of some factors that came into play. We've seen this too many times." Others warn against drawing conclusions. Tom Aveni, a police officer who is executive director of the Police Policy Studies Council, based in Spofford, N.H., conducted a recent study of 307 Michigan officers making "critical, split-second decisions that may result in the taking of a life." According to Aveni, the race of neither the officer nor the unarmed suspect was a significant factor in decision-making. Stronger correlating factors include low-light conditions, a high degree of ambiguity, the perception of felonious behavior, and abrupt movements. "You're quickly processing what you think is [illegal and dangerous] behavior, in a rapid context, in basically legal blindness because of the low light—that's not a good scenario," says Aveni, stressing that he is not speaking about Ferrell. "Especially when you're showing up with a situational bias, it has a very high likelihood of something going wrong." Meanwhile, a criminal case quickly took shape. Within 19 hours of the incident, Kerrick was charged with felony voluntary manslaughter. "The shooting of Mr. Ferrell was excessive," the Charlotte-Meckenburg Police Department said in a statement. "Our investigation has shown that Officer Kerrick did not have a lawful right to discharge his weapon during this encounter." Kerrick surrendered at the Mecklenburg County sheriff's office and was released on $50,000 bail. This was exceedingly rare: While Charlotte police used deadly force in at least a dozen instances in the past five years alone, this was the first time in more than 30 years that an officer was charged for killing someone in the line of duty. On July 19, 2011, a federal jury awarded $10 million to the parents and estate of Darryl Turner, an African-American teenager who died after being shocked with a Taser wielded by a Charlotte police officer. The officer, however, did not face criminal charges. The following day another Charlotte police officer used a Taser and killed Lareko Williams, a 21-year-old African-American. That officer, too, faced no charges. State prosecutors took over the case against Kerrick early on, when it came to light that Mecklenburg district attorney Andrew Murray had once been a law partner of a member of Kerrick's defense team. But on Jan. 21 a grand jury decided not to indict Kerrick. Charlotte NAACP president Kojo Nantambu told a television crew, "This is one of the most despicable decisions I have ever seen." Then the state attorney general's office argued that the grand jury had been four members short of the full panel, and a judge allowed the case to be resubmitted. A week later a new grand jury with the full 18 members indicted Kerrick on voluntary manslaughter charges, which carry a minimum prison term of three years. A trial is likely to begin in early 2015. "It's the first step toward justice," said Georgia Ferrell. Georgia refuses to speak Kerrick's name but says she has a place in her heart even for "that officer." Anger is poison, she says. Acknowledging how tough this has also been on Kerrick's family, she says she prays for them. "Don't forget," she says, "he is someone's son, too." Like his mom, Willie Ferrell has no tolerance for anger and hate. In his head he has written a letter to the man who killed his brother. He's not ready to share its contents, but he says this: "It wouldn't be nothing negative. I cannot continue to live, and be the person I say I am, with hate." He stops, his voice on the edge of breaking. "I hate that my brother is gone. But hating someone for the rest of my life? Nu-uh." It's a refrain you hear often from survivors of trauma: No matter how many morbid scenarios you play out in your head, no matter how well you think you know yourself, you can't know how you'll react to tragedy until it pays an unwelcome visit. Jonathan's sister, Joy, the policewoman, was ready to quit the force and even drafted a letter of resignation: How do I preserve the peace and uphold law and order when colleagues are gunning down unarmed citizens? It was Georgia who talked her daughter out of quitting. When Georgia got the call from the Charlotte police that Saturday morning informing her that her son had been killed, she sobbed. A widow who had never remarried, Georgia had borne hardship bravely and quietly, doubling down on her faith. This time would be no different. She consulted often with her Baptist pastor in Tallahassee. A reserved woman who often speaks so softly that you have to lean in to hear her, she says her belief has been strengthened, not shaken. "Fear is the enemy of faith," she says. "I hope some good comes of this. Some good has to come of this, you know?" Still, she misses her son desperately. She doesn't leave the house without a picture of Jonathan, roughly the size of a baseball card, pinned to her chest, just to the left of her heart. She carries in her purse a stuffed Winnie the Pooh she had intended to give to Jonathan's kids. She has an agreement with his fiancée: When Caché marries another man and becomes a mother, her children will consider Georgia a bonus grandma and call her Nana. It's not a contest, of course, but there's sprawling research asserting that when a child dies, it's often a sibling who takes the loss the hardest. It stands to reason that this increases sharply when the siblings were inseparable. And most who know the Ferrells surmise that Jonathan's death hit Willie hardest of all. Willie says that in those first days, he lost gallons of water weight from crying. Even so, his body started to lose its shape. His 225-pound frame gradually swelled to 255. "I wasn't overeating," he says. "It was just the stress." Jones tried to get his protégé into the gym for some cathartic workouts. When Willie said he wasn't ready, the coach didn't push it. Although Jonathan was a linebacker at FAMU before he chose academics over football, Willie decided he'd rather deliver blows in the ring than on the field. In keeping with his extroverted personality, Willie has turned to social media to try to articulate his emotions. As he put it in one tweet: "Don't know how much I miss u.... I never cried so much." He started a Twitter account in honor of his brother— @justiceforjonf—where he posts inspirational quotes such as "Life is too precious to take it for granted." When word of Jonathan's death rocketed around FAMU's campus, it triggered shrieks and silent shock and oceans of tears. But when word got to Pata, it induced something else: flashbacks. His brother, the one who played football alongside him, was Bryan Pata. The name might ring a bell. In the fall of 2006, Bryan was a senior defensive lineman at Miami and a projected first-round NFL draft pick. One evening after practice he returned to his off-campus apartment and was shot in the head. Police ruled it a homicide. Bryan's killing remains unsolved and has no known connection to race. He is buried a few feet from Trayvon Martin in Miami. As Edwin says, "It was just so crazy. The closeness to a brother. We were almost exactly the same age when we had that loss that we never saw coming. The fact that we even look alike...."
That September day last year when Pata heard the terrible news about Jonathan Ferrell, he took a minute to compose himself. He took inventory of everything he could remember from seven years earlier. What had he done right? What would he have done differently? He grabbed his phone to call Willie, and then he did some of the most meaningful coaching of his career. "I said, 'Go to the funeral and see your brother one last time,' " Pata says. "You'll see the physical body, and it will be tough. But you will walk out feeling better when you see that it's just a shell and his spirit is now somewhere else." The parallels were not lost on Willie. He'd heard so many stories about Bryan Pata that he felt as if he knew him. He obeyed Edwin. "He was so, so right," says Willie. "I can't thank him enough." Time heals, but only to an extent. "Time passes, and you will feel better. But this is like a scar that will always be there. Accept that and accept the pain." Don't be a hero. "You want to be strong and be a backbone for everyone, starting with your mom, but you need to grieve, too. When people talk to you, express your pain, too. Don't isolate yourself. Give yourself time to grieve and don't be afraid to cry." Anger is O.K. "Don't do anything crazy, don't get into trouble. Take it out in the boxing ring. But don't be afraid of anger." It's been invaluable grief counseling. Nevertheless, five months after the tragedy, Willie says he is still "working stuff out" over what he calls "the incident that happened to my brother." During lunch with Georgia and a visitor at a Tallahassee Olive Garden, he talks openly about Jonathan, happy to flip through dozens of photos in his phone. But he has yet to bring himself to visit Jonathan's grave in Tallahassee. "You really need to," says Georgia, her voice rising above a whisper for the first time all afternoon. "Nah, Mom," he says. "And I'm never going to." The 2014 Intercollegiate Boxing Championships were held last weekend, concurrent with the Final Four. But any similarities between the two events ended there. While 80,000 or so fans jammed into AT&T Stadium in Arlington, Texas, for the hoops, a few hundred converged on a side gym at a University of Miami rec center for the boxing. There was no television coverage or corporate sponsors; "hospitality" consisted of the sandwich buffet for the fighters, coaches and paramedics. On Saturday night, in the final bout of the three-day tournament—Willie Ferrell's first competitive endeavor since Jonathan's death—he fought to defend his heavyweight belt. His opponent, Darius Davison of Olivet (Mich.) College, was cheered on by his cousin Claressa Shields, a women's boxing gold medalist at the 2012 Olympics. With Georgia sitting ringside, Willie fought wearing black shorts emblazoned with the message JUSTICE FOR JONATHAN. A photo of his brother was tucked into one of his socks. It's often suggested that happy endings are simply pandering: tidy bows we put on narratives for reassurance. But sometimes sports get it right where life doesn't. Over three rounds Willie boxed with savvy and poise, complementing offense with slick defense, blending body shots and haymakers that rattled Davison's headgear. Willie fractured his right hand in the second round, but he kept fighting aggressively and won by decision. No one articulated the obvious, but when Willie climbed out of the ring, his friends, family and FAMU teammates held their hugs for an extra beat. "It's a good day," said Georgia. Willie overheard and added, "Any day you're alive is a good day."